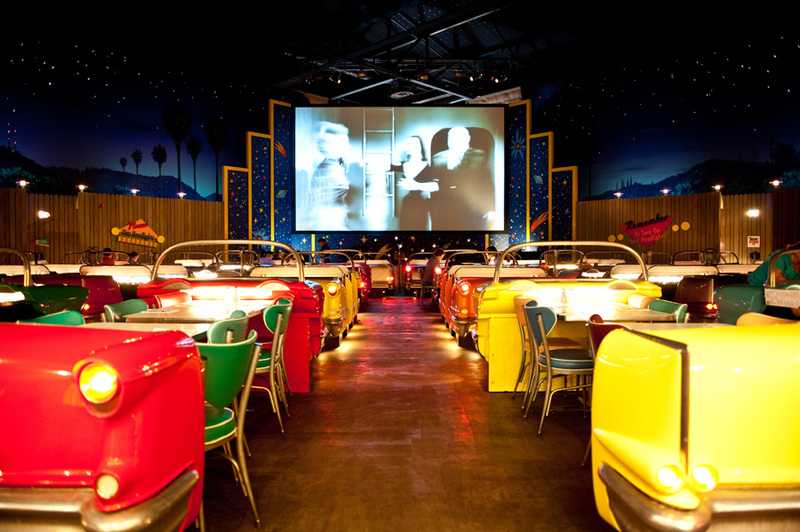 Today I am taking you to Hollywood Studios for one of my favorite table service restaurants. It is one table service credit on the dining plans. Sci-Fi Dine In is located at Hollywood Studios. It is always night time there and you are dining under the stars. You might not notice that part as your eyes will be glued to a huge movie screen playing all kinds of clips. This is the theatre lit up. You will walk in and it will be dark though. You are seated in a table that looks like a convertible. I’m sure if my husband was writing this he would tell you the exact make and model of your convertible but I will just show you a picture. They are limited to how many you can seat in one so your party will be split up if you are a large group. They are fairly close to each other and honestly you aren’t doing a lot of talking at this meal. The best aspect of this location (other than the food of course) is it is a place you can go and literally just zone out for a moment. It’s cool inside. For some reason Hollywood Studios always feels hot to me so this is ideal to step inside and cool off. The kids are entertained and you will be too by the different clips playing. 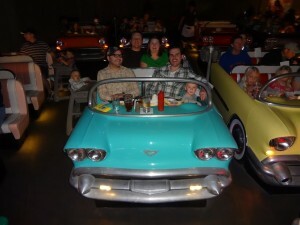 And as you can see from the pictures the convertibles do accommodate highchairs too! They have trays on them for the little ones to eat on. This was the quietest meal in terms of my children asking for things or having to get up, etc. It was quite perfect after a day of hitting every ride and character we could find and this was just lunch time. I thought the wait staff moving about would be distracting but you hardly notice them. Look at those happy kids! The littlest one is still glued to the movie screen. They are known for their All American Picnic Burger. It is enormous! 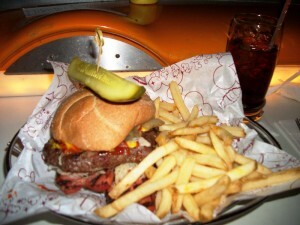 Hamburger patty plus a hot dog plus sauerkraut! I was not brave enough to try it but my husband did. Somehow he managed to finish it. It tasted exactly like it sounds-heart attack waiting to happen but he loved it. It is not recommended to eat this and then go get on the thrill rides though! 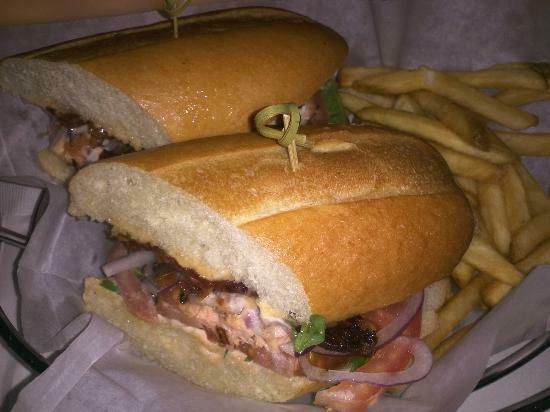 I went for a slightly lighter fare or at least as light as the menu gets here with the Salmon BLT. The portion size on this was huge as well. I am not a big Aioli fan but it was really good on the sandwich. I ordered it in hopes of choosing something slightly healthy. While it did have salmon on it, I wouldn’t say this was healthy at all given the size of the bun but it tasted good! It was the best sandwich I tried at Walt Disney World. Instead of the fries pictured, I opted for the cucumber salad. I could have just ordered a large bowl of this salad and been content! The kids loved it too but I do have slightly unusual kids in that regard and they love all things vinegar. It had a little bit of sweetness to it and just the right amount of onions. It also makes you feel better about yourself after having indulged in the huge entrees! 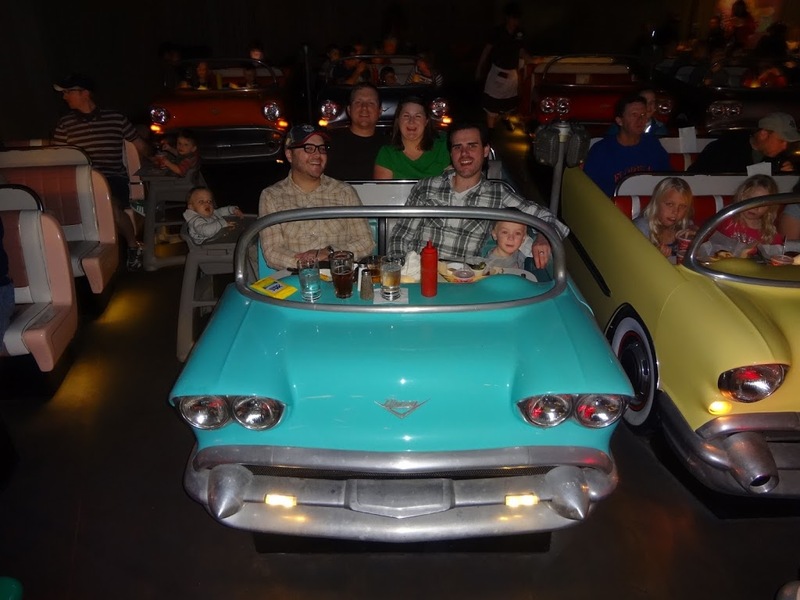 Kids will be pleased as there is all of their favorites on the menu, mac and cheese, hot dog, etc.. And the adults can enjoy some fun drinks and a decent beer menu. 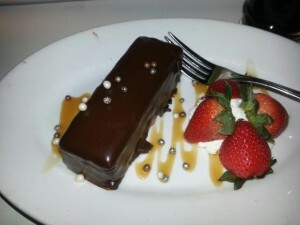 We were way too full to even consider dessert but I have been told the House Made Candy Bar is the Way to go. If I had seen this picture beforehand we would have made room for this and certainly will next time! My recommendation is if you go for lunch time, you could easily share an entrée as they were so huge. 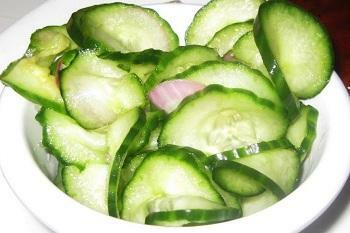 They are also so good you will eat the whole thing whether you intend to or not. I still prefer it for lunch though because it is the perfect place for some AC and some zone out time. Here is a link to the complete menu if you want to check it out. It is not a large menu but everything they do, they do well. Overall, this is on my list of top picks for clients to dine at. Great menu, unique atmosphere, and relaxing!